Montreal Transit Paths is a GIS dataset in shapefile format that maps all of the bicycle paths and routes on the Island of Montreal. The file contains information on type of bicycle path (ie. designated bike lane, shared road with automobiles etc.) and the bicycle network (Route Verte, Transcanada Trail etc.). To improve ease of use, this file was reformatted from data originally from the Geomatics Division of the City of Montreal. Reformatted Version Editor Rosa Orlandini. Walter Hitchfeld Geographic Information Centre, McGill University Library. 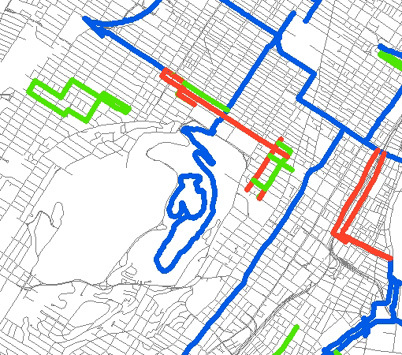 Citation Montreal Bicycle Paths. [computer file]. Montréal: City of Montreal. Geomatics Section, 2008.